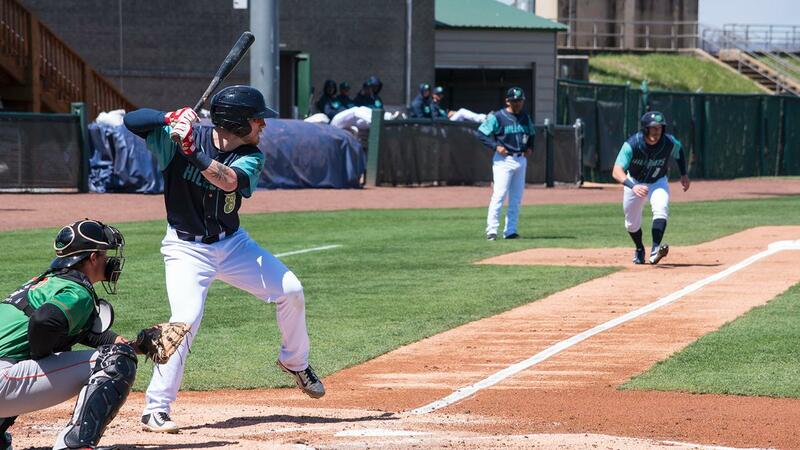 Salem, Va. - The Lynchburg Hillcats completed the four-game sweep of Salem, beating the Red Sox, 6-2, on Sunday. The Hillcats (19-17) won their season-high fifth straight game, handing the Red Sox (17-20) their seventh straight loss. Lynchburg opened the scoring in the first inning behind a two-out rally. Conner Capel walked and Li-Jen Chu singled with two down. Gavin Collins, who was just activated from the disabled list prior to the game, followed with an RBI single to plate Capel, giving the Hillcats a 1-0 lead. Luke Wakamatsu led off the third inning with a walk, and advanced to second and third base on consecutive fly outs. With two outs, Collins scored Wakamatsu with another RBI single, extending Lynchburg's lead to 2-0. Salem stormed back to tie the game in the fourth. Santiago Espinal walked and Tyler Hill was hit by a pitch to put two runners on with nobody out. Later in the frame. Bobby Dalbec ripped an RBI single to score Espinal, cutting the lead in half. Hillcats starter Felix Tati (Win 1-1) had Hill caught in between second and third base on a pick off, but threw the ball down the left field line allowing Hill to score to tie the game at 2-2. Lynchburg took the lead again in the fifth inning. Mitch Longo led off with a double, and came around to score on a Capel RBI single that made it a 3-2 contest. The Hillcats added some insurance in the ninth, when they sent nine hitters to the plate. Emmanuel Tapia and Alexis Pantoja singled and Dillon Persinger walked to load the bases. That brought up Longo, who grooved a two-run single to right field. Wakamatsu followed with an RBI single to stretch the lead to 6-2 and cap the scoring. All but one Hillcats starter recorded a hit on Sunday. Since being one-hit in Frederick last Tuesday, Lynchburg has picked up 67 hits and scored 45 runs over their past five games. Tati matched a career-high with seven innings, and allowed just two runs (one earned) on four hits. He walked two and struck out two. Dalbert Siri pitched a scoreless eighth inning and James Karinchak tossed a scoreless ninth to solidify the win. Red Sox starter Roniel Raudes (Loss, 2-4) surrendered three earned runs on seven hits in six innings. He became the first Salem pitcher to work past the fifth inning in this four-game series. Algenis Martinez gave up two earned runs in 2.1 innings and Matthew Gorst allowed a run in 0.2 innings. Lynchburg finishes the seven-game road trip with a 5-2 record. 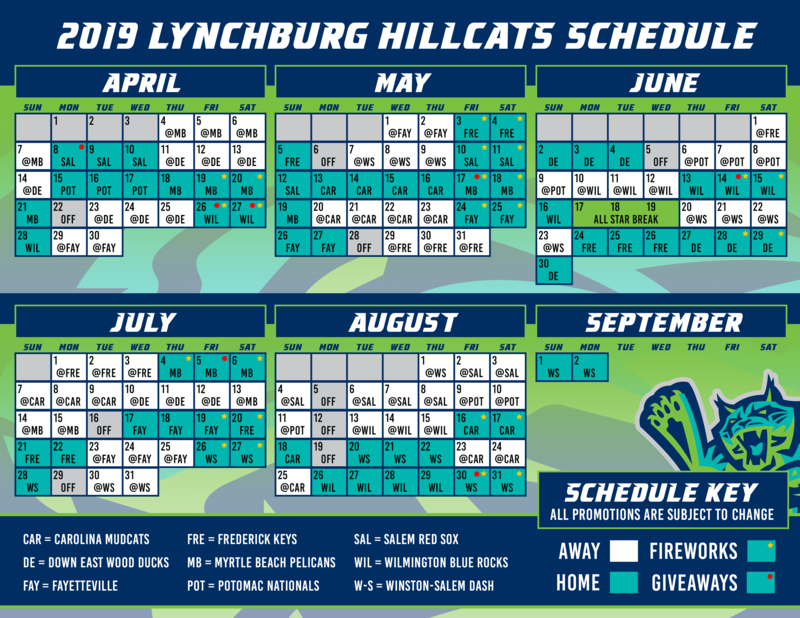 After an off day on Monday, the Hillcats will begin a seven-game homestand on Tuesday against the Frederick Keys. Right-hander Micah Miniard (0-1, 5.16) will start for Lynchburg against Keys righty Ofelky Peralta (1-3, 5.04). First pitch is scheduled for 6:30 p.m. at City Stadium.